I propose a walk through a few galleries in London, England. As I walk I would like to consider the place of religion in contemporary art. Starting at Tate Modern I will head north through the city towards the Slade School of Art. It is, if you will, a pilgrimage of faith in contemporary art and I invite you to walk with me. As I write, the Tate Modern has just opened its new and highly acclaimed extension. In a recent BBC documentary journalist Andrew Marr described it as a splendid cathedral to art with its central spire-like tower and cavernous atrium. The stairs lead up to cloisters of galleries. I choose to walk down into the Tanks, the basement section, once used to store oil when the gallery was a power station. Composed of three concrete, cylindrical galleries and devoid of natural light, it feels like a crypt or a network of catacombs or as an unholy alliance between an underground temple and brutalist car park. Here an installation by Thai filmmaker Apichatpong Weerasethakul is on display. Titled Primitive it consists of seven videos of differing durations in which the history of the border town of Nabua in northeast Thailand is re-imagined as an elusive science fiction ghost story rooted in Thai folklore. Ambiguous figures occupy dark spaces as lightning strikes the ground. The gatherers seem ready for some kind of celestial event that never quite comes to happen. Their gaze is reminiscent of Caspar David Friedrich’s wanderer looking out over the sublime wilderness, yet it also reminds me of Richard Dreyfuss trance-like stare as the aliens arrive in Close Encounters of the Third Kind. There is no coincidence here as Weerasethakul’s work investigates the similarities between collective memory, historical events and notions of the supernatural within popular science fiction. It feels like he’s talking about faith and religion but to which belief exactly is open to interpretation. 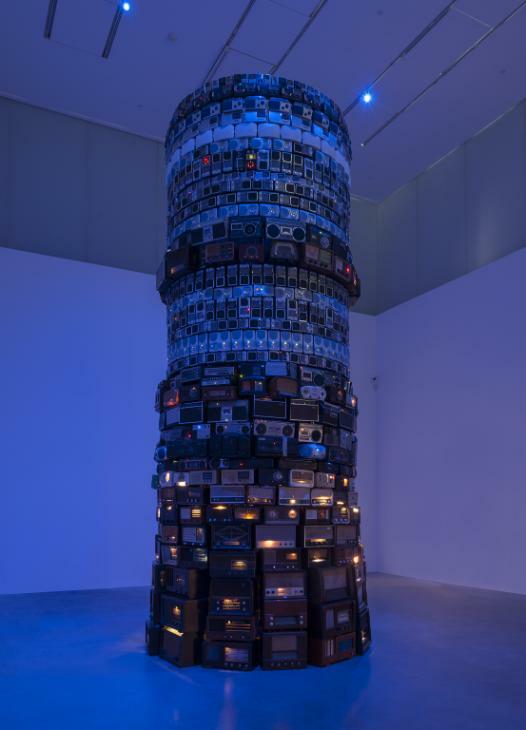 Ascending the stairs to the forth level and over the bridge I am brought to a contemporary tower of Babel, a monumental structure built of second-hand analogue radios that the artist has stacked in layers. In describing this work Cildo Meireles refers to a ‘tower of incomprehension’. I hear different voices representing different languages and competing with one another so as to be utterly incomprehensible. The tower is bathed in an eerie blue light, suggesting some kind of phenomenological event. Meireles’ sculpture seems to shadow the hulking tower of the Tate Modern itself, perhaps comparing the voices of the artworks within with the thwarted communication of the people of Babel. …it is time to set aside old assumptions about the antagonism between art and religion and look at the topic with fresh eyes. When we do so, we discover a tremendous potential for reciprocity. Continuing my walk of faith, I stroll through the city and up to the Slade School of Art. Here postgraduate students are putting the final touches on their end of year show. The work could be a call to prayer or meditation. At the same time Dryden is concerned by the sculptural issues of form, substance and materiality. His work effortlessly marries questions of the spiritual with questions about contemporary sculpture. At first I feel I am kneeling in the throne room of God, but next I am also debating form and substance in one of London’s leading art schools. Cildo Meireles: Babel, 2001. Author’s own photograph. Michael Dryden: Monachorum, 2016. Reproduced with permission from Michael Dryden.